The two leaders are meeting at a time when more Americans say they have a very or mostly favorable view of the pontiff (66%) than say the same about the president (51%). And significantly fewer have an unfavorable view of Pope Francis (11%) than see Obama unfavorably (45%). U.S. Catholic bishops have said that Catholic teaching on social justice issues is “a central and essential element of our faith.” A 2013 Pew Research survey asked U.S. Catholics an open-ended question: What is the most important way the Catholic Church helps society today? 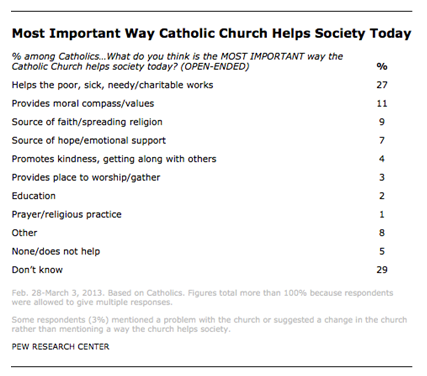 More mentioned helping the poor or other charitable works (27%) than any other response. Many U.S. Catholics are supportive of government action meant to address poverty and economic equality – including raising the minimum wage, according to a survey we conducted with USA TODAY in January. But they are not necessarily more supportive of such action than the U.S. public as a whole, and are less supportive than the religiously unaffiliated. The results are similar on the question of how much the government should do to reduce the gap between the rich and everyone else. The share of Catholics (42%) saying “a lot” is roughly the same as the share of the general public (43%) that takes the same position on this question, while, again, religiously unaffiliated Americans are more likely to say “a lot” (56%) and white evangelicals (30%) and white mainline Protestants (28%) are less likely to do so. As a group, Catholics are roughly similar to the general public on education and income, according to aggregated data from 2012 surveys in our “’Nones’ on the Rise” report. About three-in-ten Catholics have at least a college degree (29%), the same percentage as the general public overall. About 32% of Catholics have an annual family income of at least $75,000, compared with 29% of the general public. Of course, partisan differences and overall views of government also affect answers to these questions. In fact, the partisan gap on many of these questions is much larger than any differences by religious group. Among the general public, two-thirds of Democrats (67%) say the government should do a lot to reduce poverty, compared with 27% of Republicans. Tim Townsend is a former Senior Writer/Editor for the Pew Research Center Center’s Religion & Public Life Project.